From The White House Kitchen...To Yours! Sift the flour with the baking powder, salt, and sugar and set aside. In the bowl of a stand mixer fitted with paddle attachment, mix together the eggs, butter, orange juice, brandy, vanilla, and anise seeds until well blended. Add the dry ingredients all at once and mix on low speed until the dough cleans the sides of the bowl and adheres to the paddle. Remove the dough from the bowl onto a floured board. Knead by hand until smooth. Form the dough into a ball, flatten slightly, and place in a bowl. Cover with a tea towel and chill at least 2 hours or up to overnight to allow the dough to relax. Heat the oil in a deep fryer or deep pot to 350 degrees F.
Meanwhile, cut the dough into 4 or 6 equal pieces. Keeping the dough and work surface well floured, pass the dough through the widest setting of a pasta machine 3 or 4 times. Then pass through successively narrower settings until the dough is almost thin enough to see through; depending on your pasta machine, this will probably be the next to thinnest setting. Cut the dough into long strips 3 inches wide, then cut the strips on the diagonal into pieces about 3 inches long. If the dough tears, cut it off and work it back into the dough. The cookies curl when they fry, so fancier shapes are not important. As the cookies are cut, transfer them to baking sheets lined with flour-dusted tea towels, and cover with tea towels so they won't dry out before frying. Fry in batches, turning once, until puffed and golden brown, about 1 minute. Transfer with a slotted spoon to paper towels to drain. 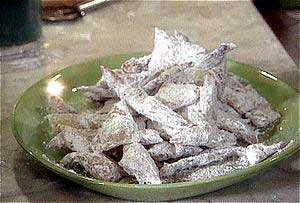 While the cookies are still hot, dust them well with powdered sugar. Wait for a few minutes while the oil and heat absorb and melt most of this first coating. Dust well a second time until the cookies are quite white. The cookies will keep for a week or so in an airtight container. You may need to re-dust them with sugar before serving. Only a few cookies at a time will fit, even in a big pot, so frying takes time. It is best to have Bush toadies like "Fredo" Gonzales in the kitchen, ready with lots of "tall tales" to keep you amused. And there are always the warm cookies to eat along the way as a reward! You can also dredge the cookies in granulated sugar, crystal sugar, or even a mix of powdered sugar and unsweetened cocoa powder.